Editors for Hire — Providing Assistance or Exploiting Hopes? Responding to a steady rise in submissions from non-English countries — particularly from countries undergoing unprecedented scientific growth — many publishers are eager to steer authors to commercial English-language editing companies rather than provide these services themselves (see “Publishing: A Helping Hand,” Nature 23 Dec 2010). Search Google for “journal editing,” “science editing,” or “English language editing,” and you’ll find a list of many commercial services willing to review, refine, and revise your manuscript at rates that reflect the type and urgency of your request. Advertised in my Cornell newsletter for postdocs were job offerings for reviewers, translators, and English-language editors for a venture called American Journal Experts, a company that brands itself by the fact that it hires only people from top American universities as English-language editors. The minimum requirement to be an editor is enrollment in a PhD or MD program. I should also be more specific about what they mean by “job” because what they are offering are not full-time, salaried positions with benefits, but piecemeal contract work. American Journal Experts was started in 2009 by Shashi Mudunuri, a Duke graduate with a BA in computer science. The company is based in Durham, NC, with over 2,000 contractors throughout the US, according to Lisa Pautler, Director of Marketing for AJE. Ms. Pautler told me contractors can make about $25/hr for their work. In addition to English-language editing, American Journal Experts will perform language translation, pre-submission peer-review, and even recommend journals to submit one’s manuscript, based on a number of criteria such as scope, impact factor, acceptance rate, and publication fees. They have partnered with many publishers, societies, and journals, and offer 10% discounts for every manuscript referred by these partners. The list of corporate logos on AJE’s website is impressive, although these relationships may raise some eyebrows. PLoS is listed as an AJE association partner, yet PLoS’s referral list also takes an explicit stand against endorsing any of them. Elsevier is listed as a publishing partner, yet runs its own language editing services, so it seems a little odd why they would send referrals to a competing company. Other custom partnership opportunities we have developed include revenue-sharing, co-marketing, and even private-label services. . . . The mission of AJE is to accelerate global discovery by helping international researchers get published. So we are particularly interested in the open access movement, and are always looking for new ways we can partner to advance the cause. To me, editorial services revenue-sharing with a publisher crosses that line of impropriety as it creates a conflict of interest between the editorial office and the services it has outsourced. The presence of publisher, journal, and association logos on the AJE site — and their description as “partners” — conveys a strong message of endorsement, while it is clear that the message of endorsement is what most publishers want to avoid. As for perceived endorsement, the logos of Harvard, MIT, Yale, Duke, Princeton, Stanford, Berkeley, and U Penn also emblazon the bottom mast of the AJE homepage. These universities are cited as places from which some AJE editors originate, yet universities don’t endorse commercial editing companies. Their main findings are not novel. Their approach is atheoretical. Their analysis is fundamentally flawed. Poor English is the least of their concerns. This is one manuscript that won’t be referred for editing. 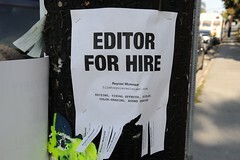 27 Thoughts on "Editors for Hire — Providing Assistance or Exploiting Hopes?" It does seem like a conflict of interest, if an editing service is recommending journals to inexperienced authors, and at the same time taking money from a journal publisher, potentially for steering those authors their way. I wam more concerned about false advertising and scamming the researchers. The influx of non-English speakers is a serious problem, so helping them write and submit is a great idea. But how do we police the process? I agree about the conflict of interest. As an editor who has worked for more than 15 years with authors (ESL and otherwise) in an academic medical center, I’ve been wondering for awhile about the fact that particular editorial services were being listed on a journal’s website. Now it becomes clearer! Does anyone know whether the editing services that get listed on a journal website actually employ some of the same manuscript editing types who also work for the journals themselves? You mention this at the beginning, but part of the “value” journals are supposed to “add” in scientific discourse is smoothing out the language so that all readers can understand the science. In blunter words, isn’t it the journal’s/publisher’s job to copy edit? It’s a sad state of affairs these days that so few journals edit papers. I can understand that peer reviewers and editors unconsciously mark down papers they find hard to read, but they are supposed to look at the science and then fix the English so that the science can be better communicated. I think there’s a difference between copy editing and what Phil is discussing here. Too often papers are submitted that are in a “first draft” state or worse. These are not all sourced from overseas, but the expectation is the publisher will “fix” them. The publisher should not be working a manusctipt into shape to publish; that’s the responsibility of the author. The English in some of these manuscripts is so poor that the editors and reviewers cannot evaluate the science. They require substantive rewriting–not copyediting. I can assure you that many of these get sent to compositors (like us) who have the job of copy editing them. We have wondered many times how a paragraph that makes no sense can get past a reviewer!! Just to be clear – the editing companies are actually providing a necessary service for non-English speaking authors, as your final anecdote makes clear. What is misleading (though the term exploiting hope is a little strong) is the presence of those logos – authors may assume that once their paper is edited by this company, it will be accepted by those journals. The relationship–or lack thereof–should be crystal clear to these authors, so that their hopes are not misplaced to be exploited. I think you’re going way too far by calling this an appearance of, or actual “conflict of interest”. Will editorial boards really be influenced by a few editorial service dollars? Most journals make money publishing author manuscripts – is that a conflict of interest too? An author will enhance their career if they get published – is that a conflict to interest too? Publishing is full “interests”. It’s not up to AJE or any other service provider to make sure that a publisher runs a truly independent editorial board. Phil, do you think that the “shortest review ever” you include at the end of the post would really help an editor to reach a decision or help the authors know how to improve their work? This is precisely the kind of review authors complain about when they say that peer review is broken. You simply state your opinion rather than explaining it. For instance, “fundamentally flawed” is a strong statement that needs at least some kind of justification. Reviews like that are nigh on useless to a journal editor. You are absolutely correct: my initial review was not constructive. I wrote the editor back and explained that the manuscript should not have gone out for review in the first place and also provided a much lengthier explanation on why their analysis was fundamentally flawed. Good editors are conscious and respectful of the time of their reviewers and will prevent papers that don’t stand a chance of acceptance from going out for review. In my opinion, this was a manuscript that slipped through his competent fingers. Good and reputable language-editing companies do provide a valuable service– they help the whole process of editorial review work more effectively and smoothly. And editors shouldn’t be sending out for review submissions in which the standard of language is very poor – it’s too much to expect reviewers to work with material where it’s difficult, and sometimes impossible, to assess the work. Transparency of any ‘partnerships’ is important, as is accurate representation of what is being offered. But there are other problems too I’ve seen, e.g. authors paying over good money and ending up with a manuscript with an inadequate general standard of English, manuscripts that on a quick check by a non-specialist look OK but are full of incorrect terminology and nomenclature, authors who pay for an initial edit but then go on to make substantial changes and additions without further input from the language editor, sometimes acknowledging the company and the company getting annoyed at having their name linked with a poor standard, authors who say they’ve used a language agency but haven’t. Phil, the rate you quote above ($25/hr) looks quite low for this kind of work, especially by highly qualified people. In the UK we have a freelance fees guide, which prices ‘substantial editing and rewriting’ at GBP27/h, i.e. around USD 43. We have to copy edit some 150,000 pages a year for journals that we typeset. As inflation goes up, market prices for journal pages go down. Consistently. I would love to pay the rates above, but we simply cannot get close to it because we would make a loss. Irene, in regards to the pay rate for editors, you mentioned that $25/hr looks pretty low. …Actually, as a former AJE contract editor, I can tell you the true pay rate is much lower! I realize that any discussion of how AJE editors are paid and/or treated is a bit off the topic of the original article, but I still think it’s helpful information to add to the picture. Many of the contract editors feel that AJE’s practices are exploitive – towards the editors. If you consider how little the contract editors are being paid (as explained below and in other comments), and then you look at the fees being charged to the customer (listed on the company’s web site), the profit margin looks pretty hefty — even if you factor in a reasonable estimate for overhead costs. Keep in mind that this business exists largely in the “cloud”. Most of the editors telecommute, and only a small number of employees work at the physical location at AJE. In reality, AJE editors often make less than $10/hour. They’re paid according to the length of the paper, regardless of how much editing needs to be done to get the paper in good shape. For example, if an AJE editor gets assigned a 3000-word paper, they get paid around $30. Most of the authors have great difficulty with English, so most of the papers need serious editing for grammar, word choice, sentence structure, etc. Therefore, it’s pretty common that a 3000-word paper will take several hours to edit. At best, if the author is fairly proficient in English, the paper could take 2 hours. In this best-case (and rare!) scenario, a 2-hour edit for a $30 paper means you’re getting $15/hr. However, this is seldom the case. Most papers take at least 4 hours to edit, so you’re getting $7.50/hr at best. It’s common to get a paper that’s in such bad shape that it takes at least 8 hours to edit, which comes out to $3.75/hr! There are still people looking for good copyeditors and prepared to pay reasonable rates for high-quality work and appropriate subject expertise. But it’s a very mixed market and includes individuals who’ve had no or minimal training, and have very little idea of what proper copyediting involves. Joining a professional association is a good demonstration of professional commitment, and also an opportunity to acquire accreditation, which can help get work. The UK-based Society for Editors and Proofreaders (SfEP) is one such organisation, and highly respected. If you take a look at the SfEP website (http://www.sfep.org.uk/) you’ll see the sorts of benefits, support and resources provided, including a Directory of Editorial Services, where members can enter details of the skills, subjects and services they can offer. I am a self-employed medical copyeditor. A large portion of my clients are non-native speakers of English from outside the United States who need help to get the English in their manuscripts good enough so that US and UK English-language medical journals will even look at their articles. Having worked in-house for a medical publisher years ago, I know that many journal publishers don’t have the funds to pay for time-intensive ESL (English as a second language) editing in-house or from freelancers whom they contract with. Katharine O’Moore-Klopf, ELS (East Setauket, NY, USA) provided professional English-language editing of this article. Those journals now refer ESL authors to me, among other self-employed medical copyeditors, but I do not have any financial relationship with the journals, nor would I want one. Please note that having your manuscript edited by me does not guarantee that it will be accepted for publication by the journal of your choice, although such editing does help your writing to be more polished. Journal editors base their decision to publish or not publish an article on the quality of the research, on how well that research is documented and described, on how important they believe the research to be, and on whether such research has already been described in their journal or elsewhere. Those are facets that I cannot fix by editing your writing. Also, because I am a medical copyeditor and *not* a medical writer, I can only edit what you have already written; I cannot write any new material for you. I can, however, edit your writing to make it flow smoothly and follow the conventions of your target journal. I’ve worked as an editor for AJE since Sept., and I would quit if I didn’t have student loans to pay. It is a huge ripoff. We make nowhere close to $25/hour. After you pass the probationary editor period, you become a junior editor. The pay is: $30 for 1501-3500 words, $40 for 2501-6000 words, and $50 for 6001-8000 words. Your work effectively doubles in each category, but you only receive $10/more. I make about $4-5/hour. It’s absolutely impossible to make $25/hour. Even if you could edit a 1501-3500 paper in one hour, you couldn’t do double the work in less than double the time and continue to earn ~$25/hour. AJE really should be ashamed for taking advantage of young doctoral students or recent grads and paying us less than minimum wage. I probably will not be working for them much longer, but the job market is really tough. I make $42,000/year in my full time position. I received full funding in my doctoral program, but I have undergrad loans that will not pay themselves. I just wanted to chime in and say that I completely agree with the AJE contract editor who posted above. I am a PhD student who worked as a contract editor for AJE from August 2011 to April 2012, and my experience was equally discouraging. The $40 I received for editing a 6000-word paper equated to $5 – $10 per hour, depending on how coherent the paper was. The “$25 per hour” claims in AJE’s recruiting materials are a preposterous overestimate. Even more discouraging, though, is the fact that the customer pays at least $230 for 6000-word paper! Thus, the large majority of customer dollars go to AJE’s full-time staff, even though the large majority of the work is performed by contractors. After several months of this, I felt undervalued to the point of exploitation. Conversations with my fellow AJE contractors indicated that this was a common experience. I began to complain to AJE management, but received only palliative or dismissive replies, and one day they suddenly fired me on the basis that I was “not a good fit” (even though my performance scores were consistently high). I can only guess that AJE contractors have an astronomical turnover rate. I’d have felt better about the whole experience if I thought I was contributing to the greater good – that is, helping foreign researchers break the language barrier and get deserved recognition for their work. However, looking at the enormous discrepancy between what I got paid and what the the customers had to pay, I started to question AJE’s underlying priorities. I don’t know how satisfied AJE’s customers tend to be, but I can affirm that there are lots of fed-up AJE contract editors out there. As someone who has had a very positive experience contracting with AJE as an editor for a year and a half, I think it may be useful to provide an alternative perspective. I, too, struggled to find a job in my field (I have an MS in Plant Biology) and took on editing as a way to pay the bills. Like others, I was discouraged by the low hourly rate for my first 10 or 15 assignments ($4-$5 dollars an hour is an accurate estimate). My hourly rate climbed consistently, however, as I became more skilled and began to earn higher bonus rates for better work. I now make well over $25 dollars an hour. That’s the truth. I am lucky to have health insurance through my wife’s employer, and I am able to make a living working at home and setting my own hours. I’ve never felt deceived or disrespected by the management at AJE and have, in fact, been impressed by their cordiality and responsiveness. I also feel pretty good about the service I’m able to provide to other scientists. My intent here is not to downplay or negate the experiences of other editors but simply to offer another perspective. Surely, the use of these university logos on the AJE home page constitutes trademark infringement as this creates confusion in the marketplace. I wonder if any of these universities’ attorneys have discovered what AJE is doing? AJE removed university logos from their homepage on February 19th or 20th. This article is very interesting. I’m a postdoctoral researcher, often reviewer, and sometimes also co-editor, and I can say that the quality of manuscripts submitted in English, including by foreign authors, is often very poor. In fact, I often have to send the manuscript back to their authors up to two or three times (and usually without much success!) in order to improve the copy before submitting it to reviewers. For this reason, I founded a few years ago the company Koonec, where I offer help in translating and writing scientific articles in English, French and Spanish, especially for researchers and physicians, notably in African and Arab countries. I have no partnership with scientific journals that could cause a problem of conflict of interest, and I work on the manuscripts until considered perfect by its author (like any other company offering this type of service I suppose). My opinion is that ultimately, what counts is the customer’s satisfaction, and I think it would be interesting to hear from people who used the services of companies like Koonec or AJE.